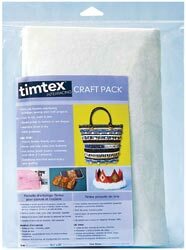 Timtex is a 100% polyester interfacing that is firm yet flexible for stabilizing sewing and craft projects. It is easy to cut, mark and sew - steam press timtex to restore or set shape. Machine wash & dry. This can be used for fabric boxes, bowls or vases, purse & tote sides and bottoms, hat brims, book covers and other 3-D projects. You can use Timtex to stabilize your machine embroidery and quilting, for trapunto, or to stabilize wall hangings instead of batting: simply machine quilt as you would with batting! This comes in a one-sheet craft-pack measuring about 15"x18".